(e.g. heating water) in heating, ventilation and air conditioning systems. PT1000, NI1000, NI 1000 TK5000 etc. Passive sensing elements for immersion temperature sensors TISB/TISS is a low cost alternative to measure temperature with simple 2 wire connection. available in 7 different lengths 50, 100, 150, 200, 250, 300 and 400 mm. for operation pressures up to 16 bar. The immersion temperature sensors TISS-versions are supplied with stainless steel pocket (s/s pocket) for operation pressures up to 40 bar. 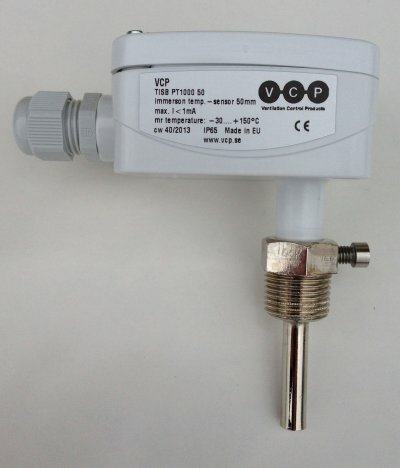 The sensing element for immersion temperature sensors TISB/TISS is located in the end of the probe and wiring connection is inside the IP 65 housing on a terminal block, the housing is supplied with a plastic cable entry gland.